Use your Macintosh (Does NOT work on Windows) to create business & personal checks & deposit slips. Includes a sample packet of check paper with personal & two business styles (140 checks total). Print blank checks or complete with payee & amount (U.S. banks only) Limited pre-printed checks use. Customize with graphics, signature & fonts. Reconcile bank statement & print reports from register. Import any QIF file (Quicken, Versacheck etc). Export to QIF or CSV. See website for more info. 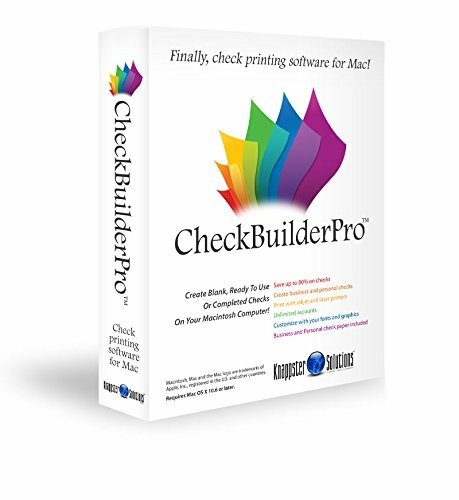 Create ready to use checks on your Macintosh computer for personal or businessuse. Print completed checks with payee, amount, etc in 1 pass, or print blankchecks ready to hand-filled or completed with your finance software (if it isso configured). Prints addresses, routing and account numbers. Memorize payee,amount, category and memo - to print completed checks with just a few clicks.Import your Quicken or Versacheck data (or any QIF file). Tracks transactionsin a check register. Print reports, Reconcile bank statement. Export to QIF,CSV or Tab files. Print on pre-printed checks (must be in sheet form 8.5x11,business checks perfed at 3.5", wallet perfed at 2.87" - Contact us for moreinfo. Check Paper Included: Business checks 3 per page; Business voucherchecks 1 to a page at top; Personal check 3 per page - 20 sheets of each for atotal of 140 checks. Requirements: Mac OS X 10.6 or higher (compatible with ElCapitan); High quality printer; Bank compatible blank check paper (samplepacket included); MICR ink or toner FOR U.S. BANKS ONLY. For questions, feelfree to contact us. Note: the program does not interface with other software,so completing with other finance software is a 2-step process. This is NOT apayroll program. Older PPC Macs require special version - contact us for moreinfo. Official bank recommendation. Many banks have optical readers thatdon't need magnetic ink, though some still have the older-style magneticreaders. Many don't use MICR toner with no problem. Your experience may vary.